Anna Patterson dances professionally with the U.S. International Ballet Company. She trained under the direction of Gelsey Kirkland in Vaganova and Bournonville at Gelsey Kirkland Academy of Classical Ballet in New York. Most days you will find Anna on the beach in Wilmington, NC or trying a new local coffee shop. Congratulations on your second season with US International Ballet! How do you prepare for a new season? Thank you! Definitely lots of cross training. I’m really loving hot yoga right now because it helps loosen my muscles so that I can work on my flexibility. What are your dance essentials for getting a season off to a great start? Water, sneakers, warmups, energizing snacks, and lots and lots of skirts! I really love tragSeligkeiten, It’s a German made ballet skirt sold on Etsy. I’m completely in love with the styles and shapes that they offer! 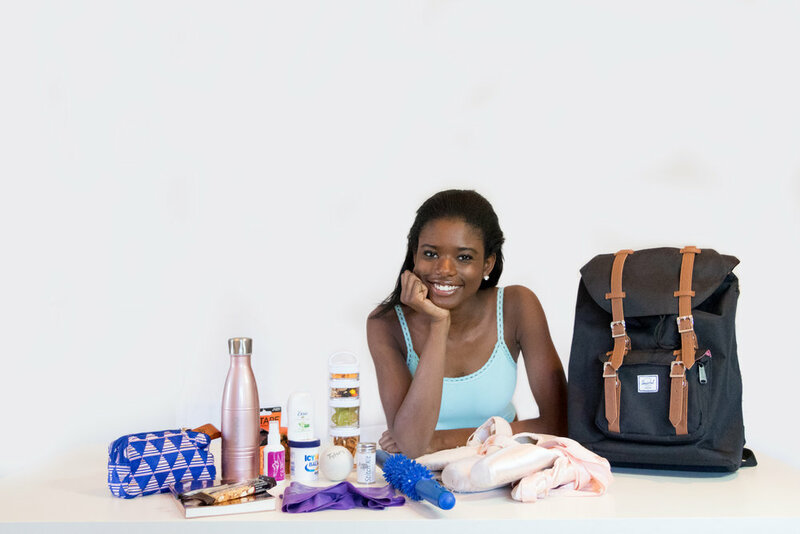 What's your must-have dance bag item? I love KT tape so much. My knees will feel a little vulnerable some days so I love to just have it for extra support. Tell me about your dance bag. I use a dance bag by lululemon. I love how spacious it is and how many compartments there are. My dance bag has everything I need for the entire day. So if anything happens or goes wrong I have anything I need. I’m always packing and unpacking it. What do you wear for warm-up as the weather gets cooler? I have some overalls by RubiaWear that I’m absolutely in love with because they keep me so warm at all times. Which pointe shoe do you wear? I wear Gaynor Minden. I like the supple shank because it’s in between really hard and really soft. I love Gaynors because I don’t have to break them and they are the quietest shoes. I hate loud shoes because it’s so distracting to me. What is your favorite studio snack? I really like either nuts or maybe a Clif Bar depending on the day. Totally random - what's your favorite Insta feed? I’m totally obsessed with Kenneth Edwards photography account. I love seeing photographers collaborate with ballerinas. I think it’s so great when artists come together and make something beautiful. Check him out - @kennethbedwards.